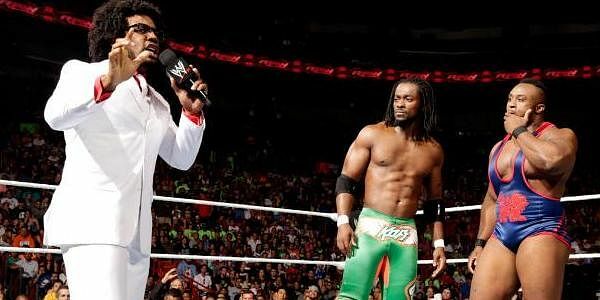 Xavier Woods had always been one of the most outspoken WWE superstars on social media, expressing himself freely long before anyone knew who he was or that he played the trombone. His relatively newfound superstardom as the mouthpiece of the New Day just made him even more outspoken, and while he's a bit of a big star now, he won't hesitate to talk to fans if he feels the need to. One intelligent (we must admit) fan found this first-hand as he got into a debate on the nuances of life and positivity with Woods—who, we must mention, has a bachelor's degree in philosophy and a master's degree in psychology. We have to warn you, though, this conversation is a little long, and some of you who aren't into all that philosophical stuff may tune out. Xavier acknowledged the tweet, claiming that "life isn't always fair!" Anyone who's lived a little (which is everyone) will agree and tell you it's true, but a fan who remembered the New Day's message of unending positivity (and non-stop clapping) spoke up and questioned Xavier. @XavierWoodsPhD what happened to positivity?? But Ry Ryan (if that is your real name) wasn't going to give up so quickly. @XavierWoodsPhD but nah, positivity would be encouraging someone to get past hardships, not merely pointing it out. @XavierWoodsPhD open YOUR mind my friend; merely showing the path is wisdom, positivity doesnt always correlate. Unless its encouraging. @XavierWoodsPhD example; which is positive: "life isnt fair?" Or "life isnt fair, but you can still succeed (if you work hard, etc)?" The question presents an opening to Woods, who then does what heels do best and spin the argument their way (without necessarily addressing the issue at hand completely). The best part about that answer is that he's sort of right and wrong at the same time (not unintentionally; you'll see why in Ryan's next couple of tweets) but it still makes sense, especially within the context of the New Day's gimmick. @XavierWoodsPhD so saying "life isnt fair" allows for positivity, but initially stumps you with a negative truth. That's still positive! Positivity is blind faith despite the odds generated by real circumstances, so Xavier can say whatever he wants to say to keep the ball rolling. Ryan's got a new bone to pick with that, though. Understood @_RyRyan but I'd rather want to fight my fight then be told to fight my fight. Self motivation is a gift that only you can open. Hence the lesson @_RyRyan - positivity lives within you and I cannot find it for you. Only you can climb that mountain. You are your leader. Whereas Xavier was slightly reaching earlier for his definition of "positive," he finally finds a good hook for his argument. Again, what he's saying makes total sense—it's kind of hard to believe that he's being a self-righteous troll at the moment, because what he's dangling isn't actually bait, when you think about it. If you didn't know any better, you'd think he was actually a hero, of the Hulk Hogan say-your-prayers-eat-your-vitamins kind. The debate continues from there along the same lines, with Woods finding his firm footing in the "only you can figure out what to do" line of thinking. Ry Ryan argues that such a mindset is subjective, but Woods doesn't deny it, as the idea of mindsets and personal philosophies is inherently subjective. This kind of preaching won't fly at all on TV, unless the product is a heavy drama with nuances and themes that make you think and reflect. And it's not. We just wanted to show you the genius that resides in Xavier Woods's brain, the genius he doesn't show you because he's too busy distracting you with claps and chants and trombone riffs. He saw an opportunity to play up his character on the Internet and ended up teaching everyone who bothered to listen an important life lesson they should, at the very least, be considering. Who knows, maybe when one day, the New Day's comedy schtick finally runs its course, they could turn into the Black Panther-type group they were going to be originally, with Woods as the WWE's Malcolm X. As controversial as that may seem, he's got the mind to back it up. But if you disagree with the way he looks at things, let's talk about it. Tell us what you think in the comments below!